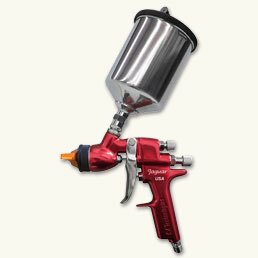 The J100H is a general purpose HVLP gravity feed gun intended for automotive and wood finishing. Features include all stainless steel fluid passages, low volume nozzles for small HP compressor use and self-adjusting needle packing. Comes standard with 750cc aluminum gravity cup. This gun complies with all HVLP environmental regulations.